Chinese culture is amongst the oldest in the world . While we’ll be celebrating America’s 243rd birthday in July, they just begun a 15 day celebration to celebrate the Chinese year 4717. Wow, that’s quite the history. Chinese New years or Spring Festival, is the biggest holiday in Chinese culture. It is celebrated with festivities, fireworks, brightly colored lights, special meals with family and gift giving, namely red packets. Cut pork into 2 by 3 inch cubes. Mix remaining ingredients in a bowl until sugar is dissolved and add pork. Put in a 300 F smoker until internal temperature reaches 110 F, about 25 minutes. Turn pork and continue to smoke until internal temperature reaches 170 F, about 20 minutes. Cover with foil and let rest for 10 minutes before serving. 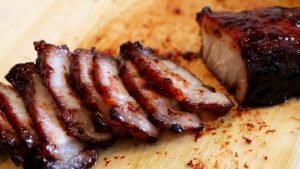 This recipe can be done in the oven by putting the pork on a rack over a cooking sheet and cooking the pork in a 350 F oven until the internal temperature is 170 F (about 40 minutes) but it will not have a smoky taste.